Alex Anderson and Chad Debaker, two “bike people,” created a vending machine that holds bike parts like lights, patch kits and tubes for cycling commuters. 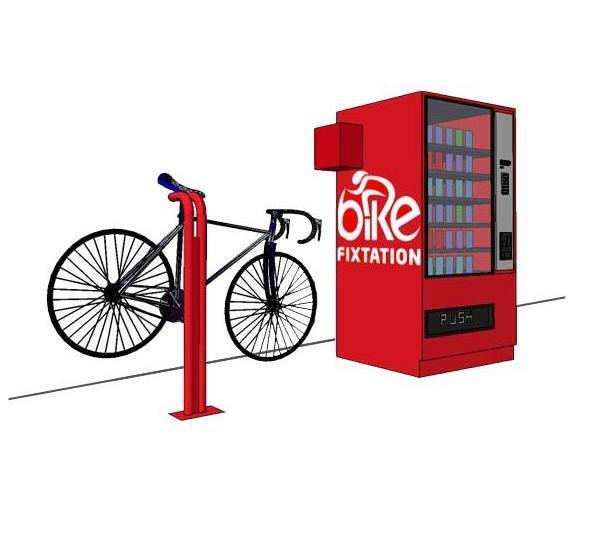 Located in Minneapolis, Minn. with only one station and another on the way, the “Bike Fixtation,” is a customized self-serve bicycle repair station and rest stop. The company works with businesses to configure specific products to vend and help source the bicycle products that serve each business’ customers best. In addition to a customized vending machine, the system also has a bike repair stand and a self-contained inflator to pump up tires. The first Bike Fixtation is located in Minneapolis’ 5.5-mile bicycle superhighway, called the Midtown Greenway. The Fixtation is the newest edition to Minneapolis’ bike infrastructure and part of the growing culture of bicycling commuting in the city. In fact, Minneapolis was named the number one U.S. city for biking in 2010 by Bicycling Magazine. The presence of strategic bicycle infrastructure, such as Bike Fixtation, is an important element of encouraging bicycle culture. GOOD Magazine eloquently makes this point by saying, “Just like car-culture has fostered a urban landscape of ubiquitous gas stations and service stations, bike culture will need more projects like Bike Fixtation to truly flourish.” Bicycle infrastructure is an essential component in making cities more bike-friendly.